Under normal circumstances, a car as profoundly brilliant as the Lamborghini Gallardo would become an uncontested collector’s item, a buy-and-hold gambit destined to deliver a solid return on investment. Here’s the thing, though: the Gallardo was so good it became the best seller in Lamborghini history and, to a large degree, was responsible for propelling the brand back into the limelight after some time lost in a late-20th-century malaise. On the downside, so many examples of the “baby bull” were built at the factory in Sant’Agata Bolognese, the chances of it ever becoming an income generator now seem remote. But here’s another thing: as good as the Gallardo was, it’s been surpassed by its immediate successor, the Huracán, in nearly every respect. The 2016 Lamborghini Huracán LP 610-4 Spyder, the third model to appear since the debut of this new line of supercars in 2014, is a stunning sun-chaser that offers a potent mix of performance and purpose, and no small amount of style. In attempting to determine how the maestros at Lamborghini managed to make the Gallardo seem outdated and ordinary, it’s important to start at the beginning—which, in the case of their latest roadster, means looking at the underpinnings. The Italian concern has long been at the forefront of carbon-fibre-reinforced manufacturing, and the super-strong properties of this material yield tangible benefits here: the Huracán Spyder boasts 40 per cent greater structural rigidity than the last Gallardo Spyder. Automotive engineers will tell you there are numerous benefits to increased chassis strength—improved crashworthiness being the most obvious. A strong chassis also sets the stage for a more dynamic experience behind the wheel. If your car remains solid over bumps, through twists, and around turns, it won’t flex at unexpected times and be thrown off its intended line. This quality, in turn, allows the engineers to utilize a suspension system with a broader range of characteristics, from super-compliant to ultra-stiff. When you’re commuting through a pothole-strewn stretch of downtown, your supercar can soften the experience; when you’re attacking the swerves of a mountain pass, it can stay perfectly planted on the ground. 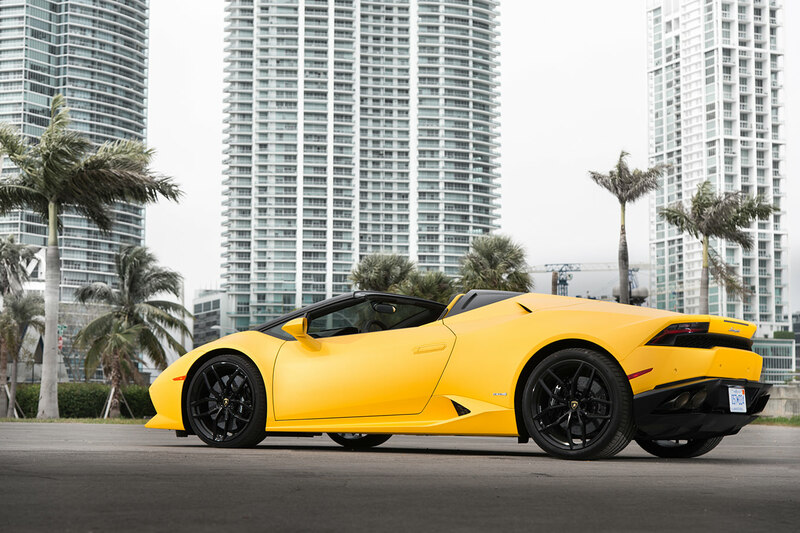 For these reasons, the Huracán Spyder has surprisingly good everyday driving dynamics for a high-horsepower convertible. On the topic of horsepower, there is much to discuss. The Spyder offers a potent mix of performance and purpose, and no small amount of style. The other big development with respect to the drivetrain: the new seven-speed dual-clutch automatic transmission. This slick shifting unit represents a massive jump in speed and smoothness over the e-gear semi-automatic transmission used in the Gallardo. The Spyder, with a folding soft-top mechanism and structural reinforcement, which add 120 kg to the bottom line, requires about 3.4 seconds to accomplish the sprint from 0 to 100 km/h. Still incredibly fast. The time to accelerate from 0 to 200 km/h is just 10.2 seconds, less time than some economy cars take to get to 100 km/h. Top speed for the droptop is a stratospheric 324 km/h—and that figure applies to both closed-roof and alfresco scenarios. The roof in question can be deployed in about 17 seconds at speeds of up to 50 km/h. The fold-and-tuck, electrohydraulic action of the convertible sees the roof split into sections and then slide into a compartment behind the two seats and immediately in front of the mid-mounted V-10. This layout serves to create a particularly visceral thrill when accelerating through a tunnel with the top down; nothing produces a roar quite like 10 voluminous cylinders firing away at full song. If you happen to find yourself powering along at 324 km/h with the top down, expect the experience to be like getting caught in the middle of a, well… hurricane. The wind will send an endless flurry of punches, the V-10 will howl as it attempts to establish new limits, and the driver and co-driver will scream, either with delight, sheer terror, or a combination of the two. Of course, you need not travel at such elevated speeds, because the Huracán Spyder is enjoyable even when circumstances veer more towards the rational. Taking its cue from the Aventador, the passenger cabin shows a particular focus on placing the driver in the spotlight. 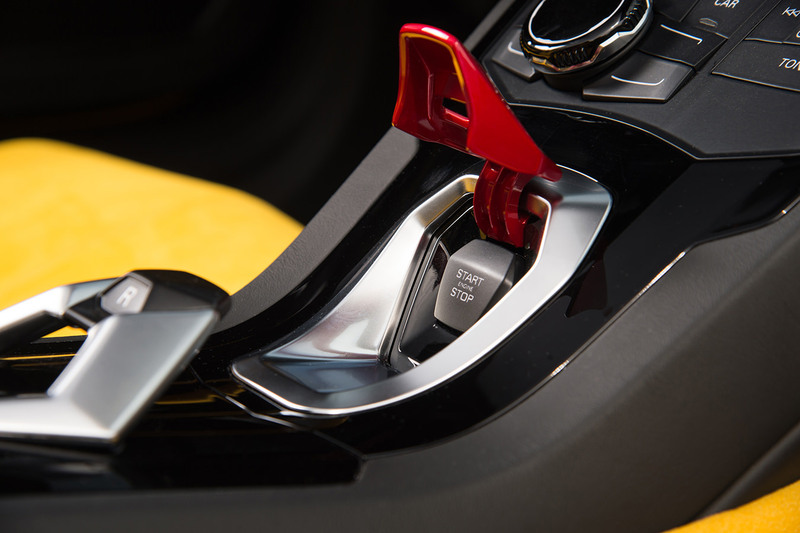 The aircraft-inspired switchgear, particularly the switch cover over the start/stop button, makes what is an undoubtedly extreme statement—but it also echoes the personality of the car. The high-resolution TFT instrument panel features three driver-selectable screens, the raciest of which features an oversized tachometer front and centre. The seats on the car are particularly good—both the standard bucket and the optional carbon-fibre race-inspired number. The latter features far less cushioning and adjustment, but it can be custom-fitted when you order the car to ensure it’s perfectly sized and positioned. The steering wheel, a grip-laden, flat-bottomed number, houses most of the controls needed when piloting the Huracán Spyder. The shift paddles are located behind the wheel. On the surface are the turn signal controls and the windshield wiper switch. Nestled within the bottom spoke is the drive mode selector, finished in danger-zone red. This variable mode system has been dubbed anima, an abbreviation of “Advanced Network Intelligence Management.” It’s also been given this moniker because anima is Italian for “soul”—and the name could not be more appropriate. There are three settings to choose from here: strada (the least aggressive), sport (the designated middle ground), and corsa (the most aggressive). Each mode triggers a different setting for the engine, transmission, electronic stability control, and all-wheel drive system; strada provides the most support for the driver, while corsa allows you to travel the ragged edge. There is also a launch control function, which automatically sends just the right amount of power to each of the four wheels to ensure the quickest of getaways. And to bring those speeds back into check, the Spyder is fitted with track-ready carbon-ceramic brakes as standard equipment. Of course, although the 2016 Lamborghini Huracán LP 610-4 is very fast indeed, it’s not a car for the racetrack—those duties are best served by the coupe version and the inevitable spinoffs of the coupe that are sure to follow shortly. Rather, this car is meant for blue-sky cruising at the highest possible rate or, at least, the highest allowed by the local constabulary. Even at city speeds, though, this Lamborghini will make an impact to rival any car in company history. The Huracán Spyder has a powerfully simple shape that looks best with the top down, a wedge-shaped rocket ship that looks capable of defying gravity at any moment. While it’s no surprise that a supercar starting at $289,242 should be so extraordinary from so many different angles, it’s worth remembering that, for its time, the Gallardo was a pretty handy machine as well. But the Huracán Spyder is without a doubt a stronger, more engaging, higher-performing supercar than the Gallardo Spyder. And this means that it comes with only one downside—it will probably never be a great choice as a collector car.